We only consider stays of 1 week or more. A spacious, comfortable home with three king bedrooms and two bathrooms, plus a separate toilet. The living area is split level, open plan with a 6 person dining table, big well set up kitchen and breakfast bar and large lounge with high white wash timber ceilings and an open fire for those cooler evenings along and a heat pump. Three bedrooms; Bedroom 1: king bed, lake view, deck access, ensuite, walk in wardrobe, Bedroom 2: super king bed, lake view, deck access, Bedroom 3: superking or 2 singles, mountain-lake view. Bathrooms 2.5 : ensuite (shower, toilet, vanity), second bathroom (bath, shower and vanity) Separate toilet. Kitchen is large, wall oven, electric hobs, microwave, large fridge, dishwasher, coffee maker, walk in pantry, usual small appliances plus well set up with top quality cookware. Two outdoor living areas, one smaller patio with pizza oven and hot tub and an expansive deck with outdoor dining and lounge seating and large BBQ all overlooking the lake. There is also a large grassed area and picnic table at the bottom of the stairs leading from the deck that although private property directly accesses the cycling/walkway, a jetty for water taxi pick ups and its only a 10 minute stroll to the Hilton's bars, restaurants, spa and deli. The property has off street parking for 3 cars and it is a 5 minute drive to Frankton shops, supermarket, bars, restaurants and take aways or a 20 minute drive to central Queenstown or Arrowtown. 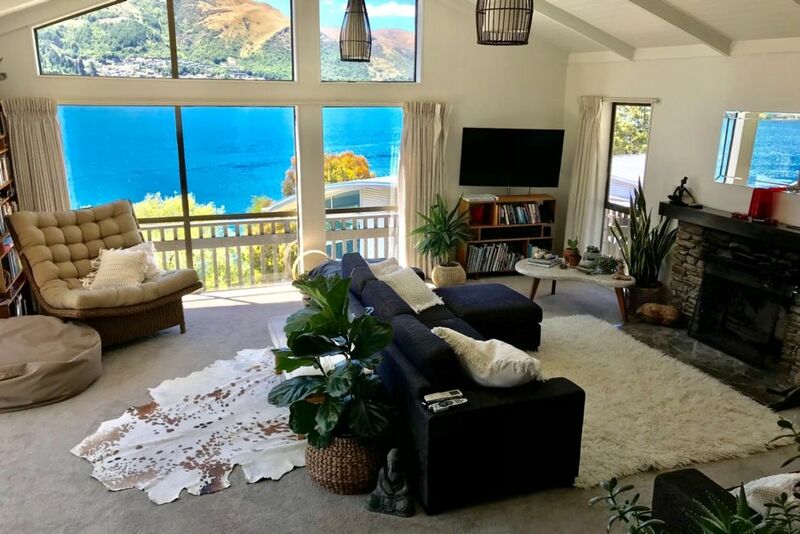 It's a warm, sunny house, with a lovely relaxed feel which is great for entertaining or simply enjoying some time out from central Queenstown's crowds. We are pet and child friendly on the basis that we trust our guests to respect our home. Although there are fences and gates around the deck there are steep drop offs to consider should your children be the adventurous type. House is set up for 6 people bed wise but additional children could easily be accommodated in the bedrooms with portacots or camp beds. Dogs must be well behaved, cleaned up after and under control at all time. Young children require close supervision due to direct lake access and steep drop offs. Waterfront with all day sun and direct access to cycling and walk way. Watertaxi to town picks up from jetty in front of house. Fantastic place. Beautiful views and comfy beds! Would highly recommend this home. The views are amazing, and the house has everything you need and more. We are sad to be leaving!